Week of dresses inspired by Kate Middleton? Cute dress! I love it styled with the denim jacket! Great dress and who can't be inspired by Kate? I've never cared much about fashion, but stumbled upon your blog six months ago. Wow – what an eye opener you have been to me! Now I enjoy trying to mix and match different pieces and whenever in doubt I just take a quick look at your blog for some similar outfits or inspirational advice. I really love the way you dress…and I also love the fact that you have a toned body and not a double 0 (which seems to be the case for many fashion bloggers out there and with whom I have problems identifying with…what looks good on them certainly does not look good on my size 4 to 6 body)! 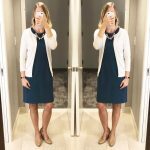 So, once again – thank you for a great blog and for finally making me dress like a lady (and enjoying it)! You should check out the outfits of Crown Princess Mary of Denmark. I think some of them would really fit your style and are more professional and adult than the Duchess's outfits. I don't hate Catherine's outfits but I like Mary's much more. Wow – thank you so much! I am really glad to hear you enjoy the blog! I hope you continue to find inspiration here and in your own closet! Thanks for the suggestion! I am always looking for new sources of inspiration! I will definitely take a look via google!